Legislation, introduced by Congresswoman Maloney, supposed to introduce Holocaust studies into curriculum in US schools and establish a federal fund to provide teachers with necessary resources; currently only eight states require mandatory study of the Shoah. A US lawmaker has teamed up with Jewish organizations to lead a bipartisan effort to improve education about the Holocaust in American schools. 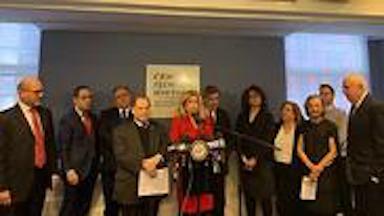 Rep. Carolyn Maloney (D-NY) and various Jewish advocacy groups on Monday announced the reintroduction of legislation entitled the Never Again Education Act. Despite successful professional development programs in the field of Holocaust studies, today, only eight states require this horrific subject to be part of the educational curriculum: California, Florida, Illinois, Indiana, Michigan, New Jersey, New York and Rhode Island. The data released by the New York City Police Department shows that at least 180 anti-Semitic incidents occurred in the city in 2018, which represents a 22% increase from the previous year and a 38.6% increase from 2016.